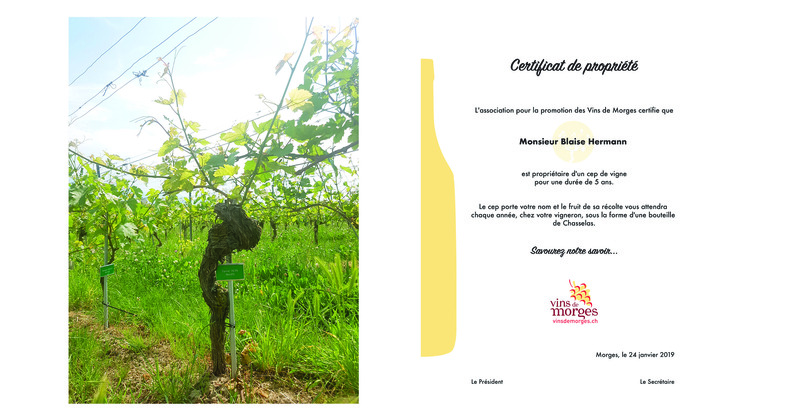 Become the owner of a vine from Morges! For CHF 150.- only, you become the proud owner of a vine which will bare your name and be taken care of by your winemaker. Your chosen winemaker will send you an ownership certificate and for 5 years, a bottle of white wine baring your name will be waiting for you! Becoming an owner is not only the opportunity for you to offer an original gift, but it is also the opportunity for you to show your support to the Morges region, whose exceptional terroir has been a reference for all informed amateurs. Have a taste of our knowledge and expertise … for 5 more years! Maintain ownership of your vine for 5 more years. The Morges wine producers offer to take care of your vine for another 5 years. Over the next 5 years, your very own annual bottle of wine will be ready for you. In order to subscribe, please download the document hereafter, and return it by email, fax or post. Alternatively, you may subscribe directly online.